In some senses we could call fibromy­al­gia the scourge of the 21st Century. I’m sure in pre­vi­ous times many people have suffered from fibromy­al­gia without hav­ing that name or pat­tern imprin­ted on their aches or pains. Essentially speak­ing, fibromy­al­gia is over­all body pain, almost at a cel­lu­lar level, where the suf­fer­er exper­i­ences aches and pains over the entire body. This includes the arms and legs and all the major areas where people will exper­i­ence sig­ni­fic­ant dis­com­fort. Pain in the lower back and neck and shoulders can be prom­in­ent symp­toms of this dis­order also. Fibromyalgia is a term a bit like chron­ic fatigue syn­drome. When someone is exper­i­en­cing fatigue all the time, then the tend­ency in the West is to cat­egor­ise people with exhaus­tion as hav­ing chron­ic fatigue. We cat­egor­ise people who have chron­ic body pain as hav­ing fibromy­al­gia. So it is not a spe­cif­ic prob­lem as such but an over­all term which embraces many dif­fer­ent con­di­tions accord­ing to tra­di­tion­al Chinese Medicine and Japanese acu­punc­ture. Fibromyalgia, from a tra­di­tion­al East Asian per­spect­ive, is a con­sequence and a res­ult of a num­ber of factors. In the back­ground, there is often a genet­ic or a con­sti­tu­tion­al factor where the indi­vidu­al is pre­dis­posed to suf­fer­ing this type of ail­ment. In addi­tion to this con­sti­tu­tion­al ele­ment, there is the life­style factor which is a major scen­ario in that someone’s immune sys­tem has been com­prom­ised by dif­fer­ent vir­uses or bac­teri­al infec­tions. The indi­vidu­al con­tin­ues to push them­selves phys­ic­ally and/or men­tally into high stress scen­ari­os and their health is already com­prom­ised by pre­vi­ous ill­ness. They may also be con­sti­tu­tion­ally com­prom­ised and this com­pounds the health prob­lems. These people tend towards a con­di­tion like fibromy­al­gia, and in some cases, chron­ic fatigue syn­drome. While we have dis­cussed chron­ic fatigue syn­drome else­where, here we are focus­ing on fibromy­al­gia itself. The con­di­tion mani­fests more prom­in­ently as pain and dis­com­fort as dis­tinct from total exhaus­tion with less pain and dis­com­fort. There is a fine line between these two con­di­tions, but both from an Oriental Medicine per­spect­ive, show evid­ence of hav­ing “pushed the bil­lycart too far” – hav­ing made an extraordin­ary effort over an exten­ded peri­od of time under duress. This is where the fibromy­al­gia can come from. There are oth­er situ­ations, such as con­stant expos­ure to air con­di­tion­ing units on a par­tic­u­lar part of the body, that can aggrav­ate the situ­ation. Essentially, in tra­di­tion­al Japanese acu­punc­ture, it is what we call a spleen defi­ciency. This is an essen­tial defi­ciency of the earth ele­ment which is the struc­ture that powers our unit, both men­tally and phys­ic­ally. 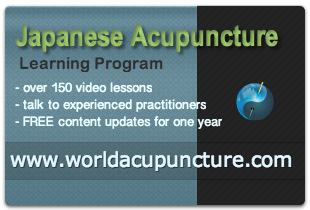 I prac­tise a gentle, meridi­an-based style of acu­punc­ture, called Japanese acu­punc­ture, which ori­gin­ated thou­sands of years ago in Oriental or East Asian Medicine. This tra­di­tion­al acu­punc­ture approach has been refined by the Japanese in the last cen­tury. It is a won­der­ful way to work with people suf­fer­ing from this con­di­tion in that it is pain-free itself – it doesn’t require deep need­ling espe­cially with fibromy­al­gia and chron­ic fatigue syn­drome. This is espe­cially true in treat­ing fibromy­al­gia. If we needle too deeply and cause too much dis­turb­ance of the tis­sue, this will often aggrav­ate the situ­ation rather than ameli­or­ate it. So I found in my clin­ic­al exper­i­ence that tra­di­tion­al Japanese acu­punc­ture is a won­der­ful way to approach this med­ic­al con­di­tion and assist people to over­come this debil­it­at­ing ill­ness. If you suf­fer from the aches and pains asso­ci­ated with fibromy­al­gia, please don’t hes­it­ate to vis­it us at our Brisbane Acupuncture clin­ic in Woolloongabba.